Ireland's former world champion Martyn Irvine has retired from competitive cycling after failing to qualify for the Rio Olympics this summer. 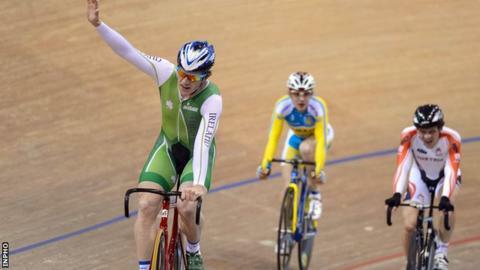 The 30-year-old County Down man became the first Irish cyclist to win a world track title in 117 years with victory in the scratch race in Belarus in 2013. Irvine also won a World Cup gold in Manchester in the same year. "Missing out on the Olympics is a big part of it and I fell out of love with cycling," said the Northern Irishman. He added: "The passion to train and put all that time into it has gone. I would just be wasting my time if I carried on." Irvine secured silver in the individual pursuit in Belarus an hour before his triumph in the scratch event at the 2013 World Championship. It was a rollercoaster year for Irvine, who also won silver in the points race at the World Championships and a European bronze medal in addition to sustaining a couple of injuries. A month after his Belarus triumph, Irvine suffered a leg fracture during the Tour of Taiwan road racing event later in 2013 sustained leg muscle injuries at a track event in Belgium. However, Irvine finished 2013 as number one scratch rider in the 2013 UCI world rankings and claimed a scratch silver medal in the 2014 Track Cycling World Championships. After winning silver in the scratch race at the 2014 World Championships in Colombia, Irvine was regarded as a strong medal contender at the Commonwealth Games in Glasgow and improving on the team pursuit bronze that he won with Northern Ireland in Delhi in 2008. However, Irvine produced disappointing performances in Glasgow and has struggled to regain form since then, with a number of injuries not helping. Irvine said the "aches and pains" were another factor in his decision to retire. "I just loved the fact that I got cycling to be more mainstream than it used to be," he added. "I'm glad I achieved some world and European success - I got some medals and got my name in the history books."